Well, she looks like a real blond which probably makes her scandinavian and resides in Minnesota or Wisconsin because of the proximity of good fishing. The boy is probably visiting G'ma from Chicago and met the girl at the Ben Franklin Store. He has no ideas of what makes these girls tick. He should have brought minnows instead of a night crawler. Isn't there a spoon pun in there somewhere, UB? Let this be an object lesson for those too cool for tuners. 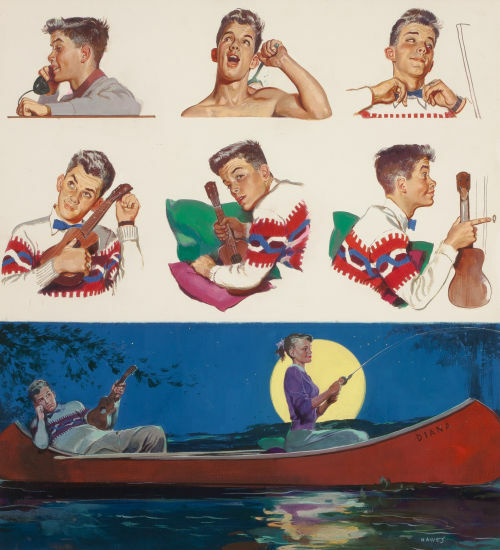 Earlier uke eras must have been hell on hearing. It is a swell sweater!